Designing today's kitchens, every cabinetmaker should try to incorporate kitchen exhaust hoods into its entire design. Not just from a functional point of view, but also from a functional point of view, modern kitchen exhaust hoods can sometimes be the center of your kitchen. In this article we would like to give a brief overview of kitchen exhaust hoods designs and functionality. There are two types of hoods, wall-attached units for kitchens where the oven is along the wall and hoods for kitchen Islands, where the oven is within the room.. Sliding hood, underneaths the hanging cabinets. The exhaust engine starts when the hood is pulled forward. Mounted underneath the hanging cabinets, visible or hidden by the front of the cabinet. Open and visible exhaust hoods give your kitchen an additional design touch, but the space above the oven can not be used for storage. Visible and angled, most of the time with a combination of steel/aluminum and glass will certainly give the kitchen something special. 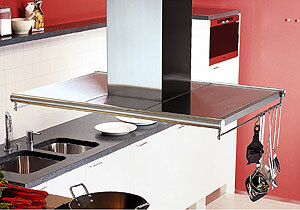 Not only the simple size of the hood, but also its design can change the impression of your kitchen design. In modern cabinetmaking one has to be aware of the interchange between furniture and appliance. Put it in a more philosophical phrase, clever chosen and integrated kitchen appliances will not just upgrade the usability of the kitchen, but also reflect the knowledge and pride of the cabinetmaker. As the following examples of kitchen exhaust hoods show, designers find new and sometimes very impressive ways to combine the technical need of an exhausting system with perfect elegant design. Another example combining different materials like glass and aluminum with round shaping. Here again one of many nice Miele kitchen exhaust hoods with rounded coverage of the exhaust tube. 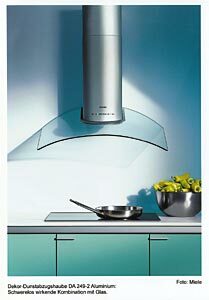 A wonderful progressive design solution (Miele) for such a simple thing as kitchen exhaust hoods. The combination of the perfectly shaped glass together with its rectagular aluminum hose coverage, make this exhaust hood the impressive center of every kitchen. Traditionally kitchen exhaust hoods have always been seen more as an additional addon than the center of the kitchen. Depending on the kitchen design, the exhaust hoods can be the quite impressive centerpiece of your room. As seen by this Bulthaup kitchen, the huge kitchen island with its large kitchen exhaust hood gives the entire room a new dimension. 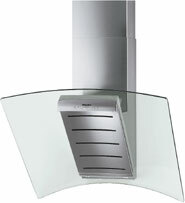 Rectangle kitchen exhaust hood (Miele) with square tube coverage. Note the handy side rails giving you additional kitchen storage for accessories. We really hope that we changed your way of thinking when you choose to design your next kitchen, as far as kitchen exhaust hoods are concerned. For every maker of kitchen cabinets, the right choice of kitchen appliances starts not just with the oven, dishwasher or the fridge, but with the kind of kitchen exhaust hood you choose to propose to your customer.